It’s easy to get fried at this time of year, as the holidays roar forward, and then past, like a train. So tonight on The Midnight Tracker, we’re going to chill with a sublimely sweet side of ’60s soul music. My introduction to Eddie Floyd came late. Seven years ago, Mojo magazine included a compilation of Southern soul music with its May issue. On that CD was a song called “I’ll Take Her.” Its premise, simply put in its lyrics: If you don’t want her, I’ll take her. That upbeat tune, with Floyd’s smooth voice lifted by some sweet horns and backup singers as it chugged along, hooked me. So I’m making up for lost time. 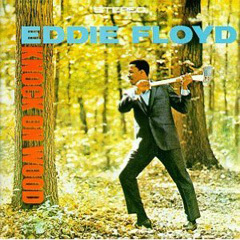 A couple of years ago, I somehow found Floyd’s debut LP, “Knock On Wood.” For whatever reason, you rarely see Eddie Floyd records in our corner of Wisconsin. Maybe, understandably, no one wants to part with them. Listen to this, and you’ll know why. “Knock On Wood,” “Something You Got,” “But It’s Alright,” “I Stand Accused,” “If You Gotta Make A Fool Of Somebody” and “I Don’t Want To Cry,” Eddie Floyd, from “Knock On Wood,” 1967. This is Side 1. It runs 17:32. The LP out of print but is available digitally. Back in 1979, when Amii Stewart did “Knock On Wood,” I had no idea it was a cover of Floyd’s 1966 single, a smash he co-wrote with the great Memphis guitarist Steve Cropper, but a song originally intended for Otis Redding. Told you I was late to the party. This side of the LP is all covers, aside from the title track. “Something You Got” came from New Orleans, done first by Chris Kenner with help from Allen Toussaint in 1961. “But It’s Alright” was a hit for J.J. Jackson in 1966. Jerry Butler co-wrote “I Stand Accused” with his brother Billy and released it as a single in 1964. The fifth cut, “If You Gotta Make A Fool Of Somebody,” was a hit for James Ray in 1962, but I came to know it via the Amazing Rhythm Aces, who covered it on their self-titled 1979 LP, which is one of my favorites. “I Don’t Want To Cry” is Chuck Jackson’s first hit from 1961. This LP, recorded in the latter part of 1966, is Floyd backed by Booker T. and the M.G.’s. Not bad for your first solo record. At the time, Floyd was working mostly as a songwriter at Stax Records in Memphis, often for his old friend Wilson Pickett. Floyd and Pickett had sung together with the Falcons, a Detroit group, in the early ’60s. Floyd founded the group in 1955. It disbanded when Pickett went solo in 1963, and Floyd turned to songwriting. He joined Stax in 1965. After “Knock On Wood,” all that changed. It’s hard to tell how much Eddie Floyd, now 75, still performs, if at all. Summer before last, he mentored young people at the Stax Music Academy in Memphis. Interviews with Floyd suggest a gentleman as sweet as his music. Political operatives are everywhere these days. They’re most often on the other end of your phone, robocalling. They’re stuffing postcards into the mail, perhaps never realizing those cards usually go directly from the mail drop to the recycling bin without coming into the house. They’re down at the corner, planting campaign signs in the highway right-of-way, which is a Bozo no-no in Wisconsin. Your mission, should you decide to accept it, is to enjoy our notion of a soundtrack for all this intrigue. 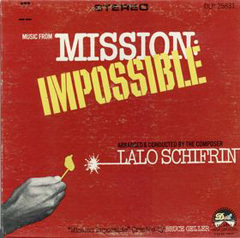 “Mission: Impossible,” “Jim On The Move,” “Operation Charm,” The Sniper, “Rollin Hand” and “The Plot,” from Lalo Schifrin, “Music From ‘Mission: Impossible’,” 1967. This is Side 1. It runs 17:07. It’s out of print, including a 1996 CD reissue. Starting with the full version of the familiar TV theme song, a classic, this is a wonderfully evocative, suggestive side of late ’60s jazz and pop. Recorded over three days in October 1967, it reached No. 11 on the Billboard jazz chart in 1968. Arranged and conducted by Schifrin, it’s performed by a who’s who of great Hollywood studio musicians. Mike Melvoin has the piano solo on “Jim On The Move.” Bill Plummer (of the Cosmic Brotherhood) plays sitar on “The Sniper” (a strategy we most emphatically do not endorse). The flip side has sax solos by Bud Shank. It’s almost too sophisticated to be a backdrop for today’s mean political climate. Is anyone carrying out “Operation Charm” in an attempt to woo undecided voters? Didn’t think so. Then again, even 45 years on, “The Plot” still tips you to something nasty going down.